Warner Bros. recently announced their plans for a Joker Origin Movie movie and now they're swinging for the fences in casting an actor to portray the Joker. The studio is reportedly hoping that with Martin Scorsese attached to the project he can persuade Leonardo DiCaprio to come on board and play the Clown Prince of Crime in this spin-off from the DCEU, which will not be attached to that cinematic universe. Fans and the Hollywood community were shocked to hear that Scorsese's name was being thrown around to produce the movie, which is set to be directed by Hangover director Todd Phillips and expected to launch Warner Bros.' new label that will work alone from the current DC movies. The Hollywood Reporter was the first to deliver the news, with sources saying the studio hopes to get the big names attached to bring back the success of Christopher Nolan's Dark Knight trilogy. 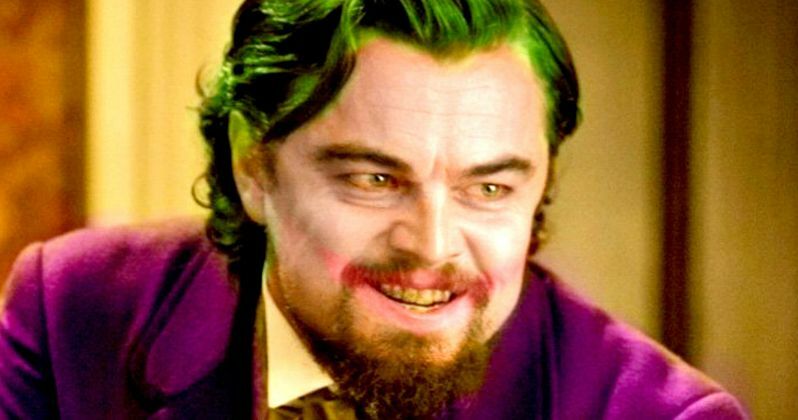 Their sources also say that Leonardo DiCaprio is the number one choice to play the Joker in the origin story spin-off in an attempt to make a gritty movie starring "A-list" stars. The idea is that DiCaprio will want to take part in the project to work with his mentor, Scorsese, again. Now, it's important to note that Martin Scorsese isn't officially attached to the project just yet and he would only be producing, but that was part of the plan to get DiCaprio on board all along. While the dots do seem to connect, it would certainly be an odd pairing to have Todd Phillips directing DiCaprio and just looking at the idea on paper seems to be off. The THR sources say that talks with Scorsese are ongoing, but that the chances of DiCaprio joining the cast of the movie are "slim to none." Usually in a situation like this, warnings of not trusting "sources" outright would be placed right about here in an article. However, these sources appear to be right on the money about DiCaprio jumping on board to play the Joker in some new banner or logo or whatever you want to call it for Warner Bros. The DCEU already has an A-list Joker in Jared Leto in Suicide Squad 2 and the Joker and Harley Quinn spin-off movie and there are plenty of people who are champing at the bit to get a chance to play a young Joker in the origin story. Sources close to the studio are also saying that Leto was caught off-guard (like the rest of us) with Warner Bros. announcement that they were making a standalone Joker origin story without using his version of the villainous character. The sources say that Leto has been complaining to his agents about the decision to work on a Joker project without him, which is understandable. Love him or hate him, Leto put his all into the character and put an entirely new spin on the Joker. The idea of a dark, gritty, and realistic origin movie about a traditional gangster-like Joker terrorizing Gotham City with DiCaprio in the lead role and 74-year old Scorsese providing creative advice from the producer's chair might be a good idea to some, but it just looks a little too good to be true on this side of the fence. Regardless of the choice that Warner Bros. makes in the end will spark a huge debate about who played the character the best. At this time, there has been no official word from Martin Scorsese or Leonardo DiCaprio's camp about the Joker origin story.